The PowerShot S300 Digital ELPH (also known as IXY DIGITAL 300 in Europe) is Canon's second ultra-compact digital camera and at the time of this review it's the world's smallest and lightest 2.1 megapixel camera with a 3x zoom lens. In addition the S300 offers a number of new and improved features including: direct print capabilities with the new Canon Card Photo Printer CP-10; 20 frame-per-second movie clips with audio at selectable resolutions up to 640x480 pixels; shutter speeds from 1 second to 1/1500 second; an adaptive primary color filter for improved color reproduction; a choice of nine image quality modes; automatic exposure sensitivity adjustment; and a high-output light guide flash. Inside is state of the art image processing hardware with a new high-speed digital signal processing IC with low power consumption and a high performance 0.37-inch CCD imager with 2.11 million pixel resolution. Finished JPEG pictures are captured in 1600 x 1200 resolution or 1024x768 and 640x480 when set in the Middle or Small modes. Sequential shooting mode offers a capture rate of 2 pictures per second in full resolution with the LCD and flash off. The equivalent film sensitivity is fixed at ISO 100 but gains up automatically to ISO 150 in low light. When powered down, the lens is safely tucked away inside of the highly durable stainless steel body that measures just 3.7 x 2.5 x 1.2 inches. This is truly a "pocket size" camera that weighs a scant 8.5 ounces. As with all the Canon compacts, the S300 has a light-assisted autofocus that even works in the dark. An advanced TTL AiAF three-point autofocus system permits the camera to automatically select the primary subject even when off-center. Metering is accomplished using a 64-zone, center-weighted TTL exposure system. Shutter speeds are automatically controlled and range from 1 to 1/1500 sec (1-sec. 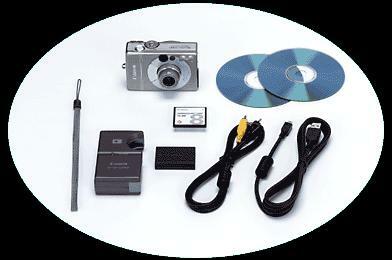 for Slow-Synchro mode and manual with flash set to off). The built in flash offers Auto, On, Off, Red-Eye Reduction and Slow-Synchro modes. There's a high-speed USB interface for image downloads to the host computer. 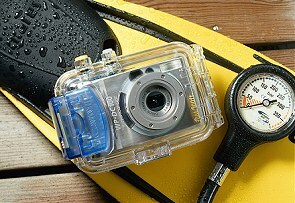 Canon will be offering its own WP-DC100 underwater case for the S300 that's good for depths of up to 30 meters. The S300 is only slightly larger than a pack of cigarettes! At PMA 2001 Chuck Westfall demonstrated the PowerShot S300's Direct Print mode that enables users to print hard-copy images with Canon's new CP-10 dye-sublimation printer. The CP-10 makes printing from digital files simple and fun by allowing users to control all print settings directly from the camera's LCD monitor. Printer data is then transferred to the CP-10 directly through a dedicated interface cable. The new, ultra-compact printer produces beautiful, 300 x 300 dpi credit card-sized color prints in as little as 56 seconds. Click here to see our Canon CP-10 Card Printer review for more details. The bright 1.5" color LCD uses energy-efficient white LEDs for back light illumination and has a non-reflective coating that reduces fingerprint and nose smears. We'll detail the user controls on the next page. The Sony DSC-S75 and Canon S300 for size comparison. Shutter Speed : 1 - 1/1500 sec. Figures in brackets ( ) represent max. recording time for one movie clip.